the happygirl: five things to be happy about this week. five things to be happy about this week. That's me. 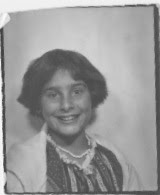 Age 7. Memorial Day Weekend. When I was a little girl growing up in Massachusetts, Memorial Day Weekend meant that summer officially started. It was the weekend my mom pulled out the summer clothes and I started wearing my puka shell necklace (see picture above). It was also the weekend that my grandfather and I sat down on the front steps of our trailer as he went through his box from the war. I remember how cool the metal dog tags felt in my hand as he carefully handed them to me. My grandfather shook his head looking at pictures of his 'brothers' in Normandy. "Look, kid," he would say. "This was Jack. Goddamn kid didn't make it home." I nodded and held his dog tags tighter in my fist. It was hard to imagine that a smiling boy as young as my cousins died on a beach in a place so far away. I was 7 years-old that first summer my grandfather told me about Jack. It became a tradition after that day, one I looked forward to every year, just a grandfather and a girl he called 'kid.' To this day I wish Jack had someone he could have called 'kid' too. As we kick off summer with Memorial Day, here are five things to be happy about this week. 1. Unforgettable homecomings of brave soldiers. This photo is from the gardenia tree we picked up at the nursery this week. Even if you have a small outdoor space, the gardenia scent is heavenly. 3. Snow White and the Huntsmen comes out this Friday. Finally! "Mirror mirror on the wall, who's the fairest one of all?" "This girl who is fair AND fierce." One of our favorite weekend activities is browsing the farmer's markets here in Seattle. 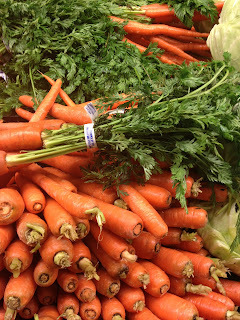 We love the carrots and organic free range eggs from local farms. 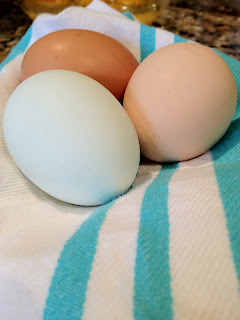 Yes, that is a blue eggshell from Americana hens! Click here to find a farmer's market in your area.